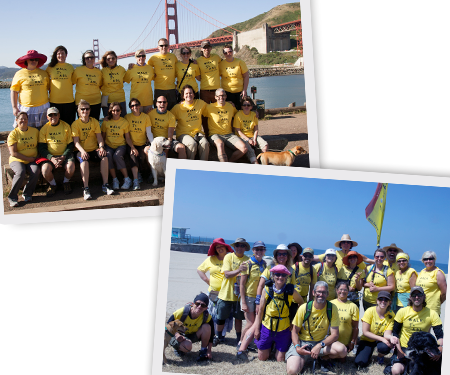 From May 1 to May 30, 2013, a group of Deaf adventurers and advocates walked from the Golden Gate Bridge to Santa Monica Beach. The Walk was a fundraiser for Facundo Element, a nonprofit organization of Deaf social-justice activists that offers training, workshops, posts provocative essays online, and produces short ASL videos and films. The itinerary was carefully planned by Ryan Commerson and Bucky Buckhold to allow sufficient rest between walks, and the food was, we've been told, incomparably excellent, with the skillful cookery of the team of chefs, using lots of fresh local vegetables and fruits. Others assisted with the transportation of the tents and equipment. They had several sponsors, too. The Walkers raised $10,000, of which $3,000 was donated to the Deafhood Foundation, with the balance slated for a new ASL film project. Not only that, they raised their own Deaf awareness. There were numerous freewheeling discussions along the way about Deaf community, language, empowerment, identity, terminology, devising a new sign for "Deaf," and other hot topics. They also saw some spectacular scenery, including sunsets and sunrises along the Californian coast. Alison L. Aubrecht, who conceived the idea of the Walk, was the Facilitator. Other Walkers were Nancy Bennett, Ryan Commerson, Julia Cameron Damon, Sharon Ann Dror, Karen Freitas, Carol Hirsch, Susan Jane LeHoven, Joette Paulone, Raja Rajeshwari (Kristen M. Weiner), Michael Serrato, Pauline Spanbauer, Robert Walker, Butch Zein, and Heidi L. Zimmer. Volunteers were: Rachel Berman Blythe, Chris Blythe, Ruth Ellen, Jon Kastrup, and Caroline Weynerowski. Caroline, Rachel, and Chris were the chefs. There were a few injuries (falls) and medical situations—e.g., Ruth Ellen slipped on a seaweed-slimy ramp near Golden Gate Bridge just before the Walk commenced, and required emergency treatment and stitches where her leg was gashed—but none of the Walkers dropped out. Daily treks averaged 15 miles, with weekend stops at campgrounds for recuperation. Reaching the end of the journey and parting were bittersweet, but the Walkers returned to their homes across the country energized. Typical comment: "It was an amazing experience!" Said Aubrecht: "We are looking forward to seeing the ripple effects of our discussions, very curious to see what the community comes up with." A few weeks later, Carol Hirsch announced that she was running for Mayor of Frederick, Maryland.